It's important that your customers and leads talk to the right person at the right time. Within your organization, you may have teammates or reps who are responsible for certain territories or you may want your marketing team handle conversations from people who started on your events page! You can create different rules for your Conversation Routing right from within the Drift app! The Default Routing Rule is available on all Drift accounts. Conditional Conversation Routing rules are available on the Pro plan and above. Your Conversation Routing Rules determine who is routed (added as a participant) in a given conversation depending on a set of criteria. For example, routing in one or more sales reps when someone starts a Drift conversation from your pricing page. You can easily specify when, where, and how this happens. All Drift accounts include a Default Routing Rule. Your Default Rule should be thought of as your fallback rule and should contain one or more teammates who can field a large variety of conversations so that no conversation goes unrouted, should a visitor fail to match all of your other conditional rules. Custom Audience - route based on URL, website behavior, Drift status, etc. For more on Audience conditions, click here. Additional routing rule options for Premium plan customers and above. Firmographics - route based on number of employees, company revenue, and industry (enriched from IP Address, requires Account Based Marketing). Read more about ABM, Drift Intel, and Clearbit Enrichment here. These two types of rules live side-by-side in Team Settings under Conversation Routing. To create a new routing rule, head to Settings > Team Settings > Conversation Routing, or click here. Click the Create New Rule button in the top right. You'll be brought to a page where you can set the parameters of your routing rule. Type in a name for your rule, and then click Add a condition to add parameters for your rule. The condition set builder should look very similar to how you add Audience settings for bot Playbooks! 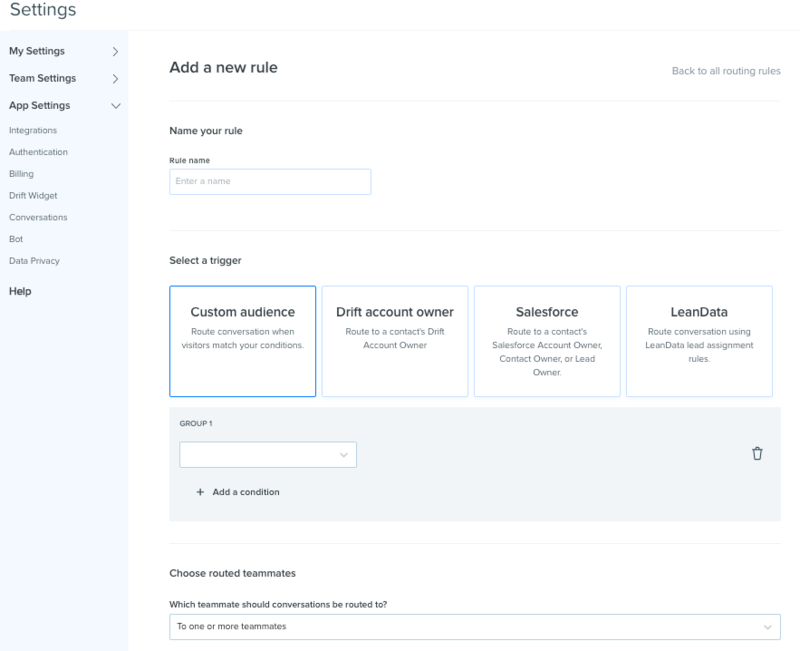 At this time, you can't use multiple filters with the Salesforce and Targeted Accounts routing rules. Once you've selected how you want routing to occur, select the participant(s) you want to add! Then, choose if you'd like to add one (1) teammate from within the group (randomized, round-robin style) or all the teammates in the group. Click Save when you're finished! When routing via your conversation routing rules, your rules are evaluated according to their priority. You can re-order these rules by hovering over any rule and clicking the six (6) dot glyph and dragging the rule into the desired place. If you ever have a question of why a conversation routed or didn't route in a way, you can look at the Routing Audit Log within the Conversation View. Whenever a routing rule is used, we explain why your teammate was or was not added, including what Routing Rules they failed to match if they were higher priority in the global Routing Rules list! To read more about the Routing Audit Log, read our doc here. Tip: Check out the Team Availability Bot Skill in the Chat Widget > Drift Bot Settings which can automatically reroute conversations when the first routed rep doesn't respond!